Labor Day weekend is synonymous with a last celebration of the summer vacation season, but also as one of the deadliest weekends of the year – in Montana and nationwide. That’s why the Missoula Police Department, Montana Highway Patrol and other law enforcement agencies across the state will increase patrols as part of the Drive Sober or Get Pulled Over campaign. According to the Montana Department of Transportation, from 2013 to 2017 there were 42 fatalities statewide within the two-week period up to and including Labor Day weekend. About 60 percent of those involved an impaired driver. This weekend’s patrols will focus on preventing drunken driving and enforcing traffic laws. The extra manpower will be funded through the Montana DOT. “It seems like anytime there’s a major event or a major weekend that people like to celebrate there seems to be an uptick in impaired driving just because there’s more people out celebrating the day or celebrating the weekend than there typically would be,” said Missoula Police Sgt. Greg Amundsen. The Missoula police force will bring in extra officers to focus on traffic stops during the weekend, while the Montana Highway Patrol will add a safety enforcement traffic team in the Missoula area. Those five troopers and an extra sergeant will focus on DUI stops and seatbelt enforcement. “We’re as proactive as we can be. We don’t like reactive policing, we like proactive policing that deters people from getting in crashes and stops people from drinking and driving,” said Montana Highway Patrol District I Commander Jim Kitchen. According to Kitchen, during the first few days of September in 2017, about 14 crashes occurred and seven DUI arrests were made in District I, which includes Ravalli, Mineral, Sanders and Missoula counties. During the same time period and district in 2016, 25 crashes occurred and nine DUI arrests were made. No fatalities occurred during those periods both years. Kitchen said lower numbers and fatalities can result from a number of factors, but proactive enforcement, public service announcements and responsible party-goers can help keep accidents low when it comes to impaired driving. According to the state DOT, as of August 27, 112 people have been killed this year on Montana highways, compared to the 129 fatalities for this same time period in 2017. About 56 of those may be attributed to impaired driving, according to Montana Highway Patrol crash data. Driving while impaired can result a DUI, a revoked license, possible jail time and up to $10,000 in fines. DUI Task Force coordinator Lonie Hutchison said that Montana has one of the highest rates in the nation for fatalities caused by impaired drivers. Occupants being ejected out of a vehicle due to improper restraint also is a frequent cause of death in Montana. “The most common fatal crash scenario in Missoula County and in Montana is a male driver, driving under the influence, no seatbelt, falling asleep and rolling their vehicle, and a lot of the times it’s a pickup truck,” Hutchison said. Since alternative transportation companies like Uber and Lyft are new to the Missoula area, Hutchison hopes it helps deter people from getting behind the wheel. Taking safety precautions is also important, with about 90 percent of urban Missoulians wearing their seatbelt, she said. 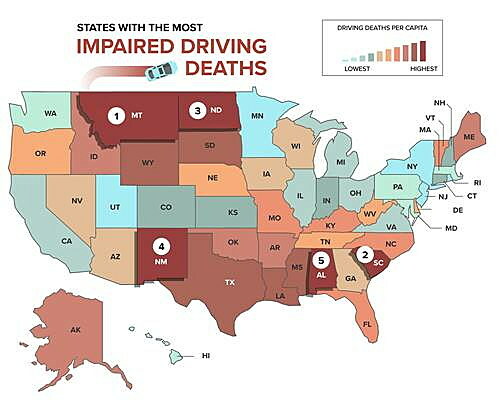 Audrey Allums, the grants bureau chief with the Montana Department of Transportation, said that while Montana has a small population, a large portion of people drink alcohol, which can result in impaired driving. Labor Day can be enjoyable, but being safe and deciding how to get home before going out should be a top priority, she said. As part of the statewide Vision Zero initiative, the department hopes to eliminate the number of deaths on Montana roadways. Education, enforcement, engineering of roads and emergency medical response are the four major groups that work together toward this initiative.